The brainchild of a couple with a love for good food, The Elk in Solaris Mont Kiara serves a combination of Western, Fusion and Asian dishes inspired by their travels across the globe. 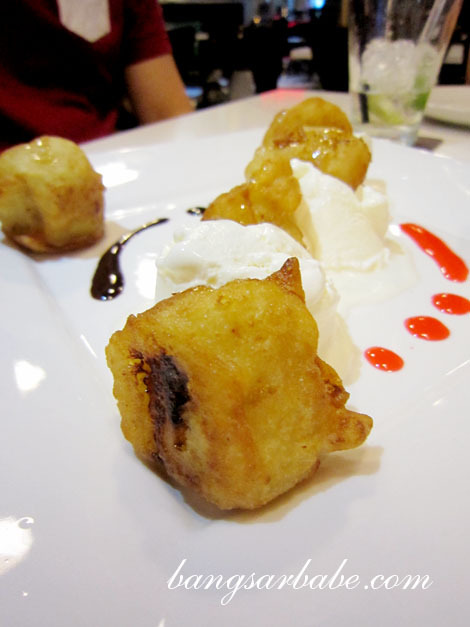 The Elk’s promise of generous portions and rich hearty flavours was what attracted rif and I to check the place out. The interior felt cosy and personal, with pictures of their vacation in various parts of Europe and a sofa area at one corner. 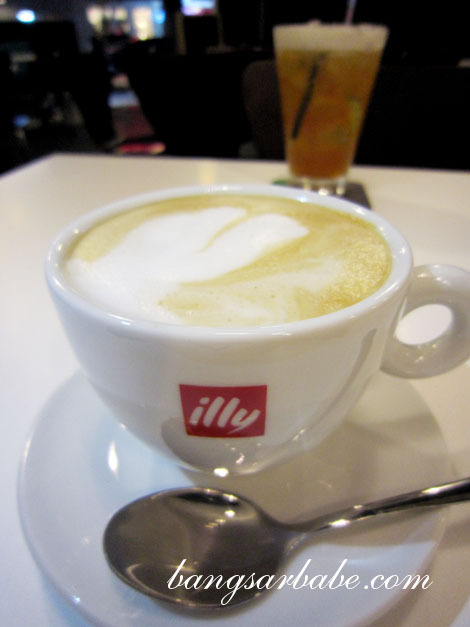 My latte (RM7) was alright, but rif’s Spicy Lychee (RM9) was most interesting. 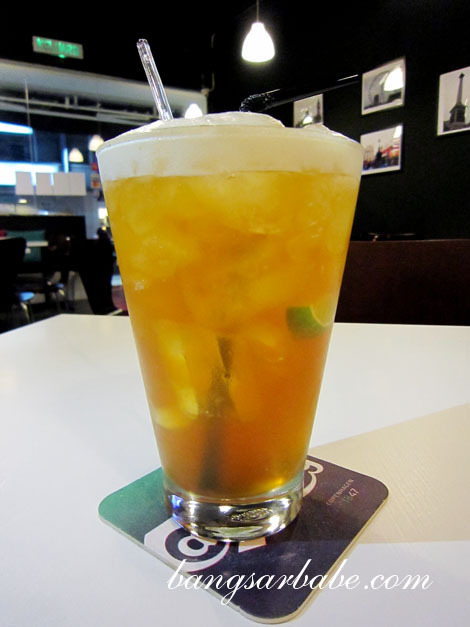 Sweet and fruity with a mildly spicy aftertaste. 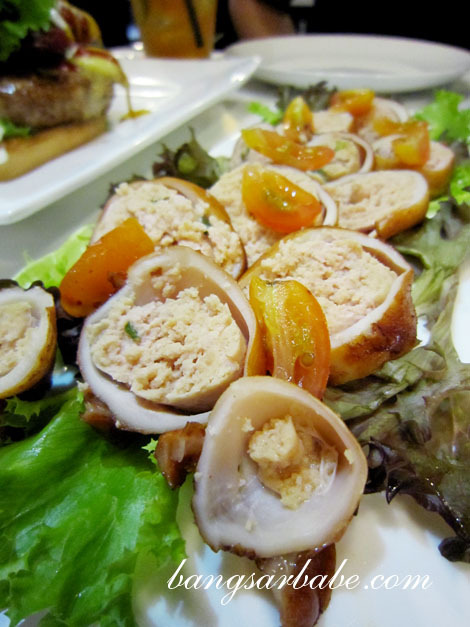 Stuffed Squid (RM12) was an interesting starter of tender squid with minced pork, garlic and onion. I was told it was inspired by the Vietnamese grilled squid. The garlicky-porky flavour of the filling gave the squid an extra oomph; perfect with a cold pint of beer. The patty was well seasoned and moist – one of the best pork burgers I’ve had so far. They have a less decadent version, Special Pork Burger, if you’re not that big an eater. 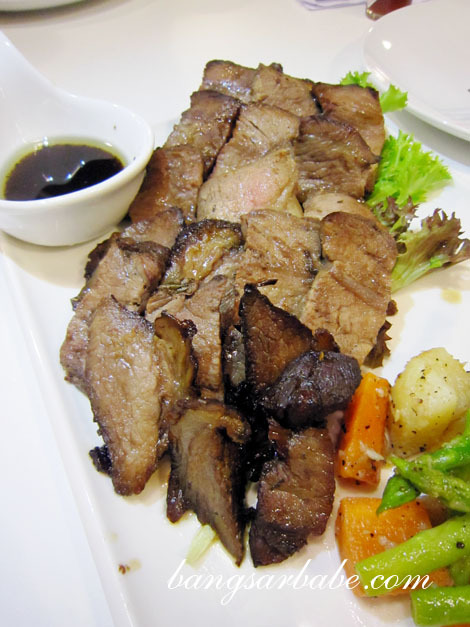 Also good was the Black Angus Roast Beef (RM40), served with red wine butter gravy. 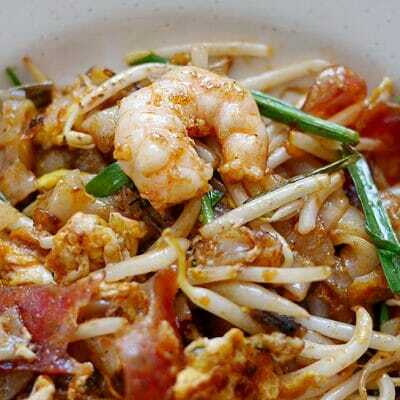 According to Khaw, the dishes have gone through various tasting processes until they were satisfied with the outcome. Almost everything was made in-house; seasonings, oils, sauces and even the pastas. I found the rim of fat on the beef particularly tasty as it was redolent of the seasoning and had a soft, almost buttery texture. Try to eat this as quickly as possible as the meat is most tender when it is warm. 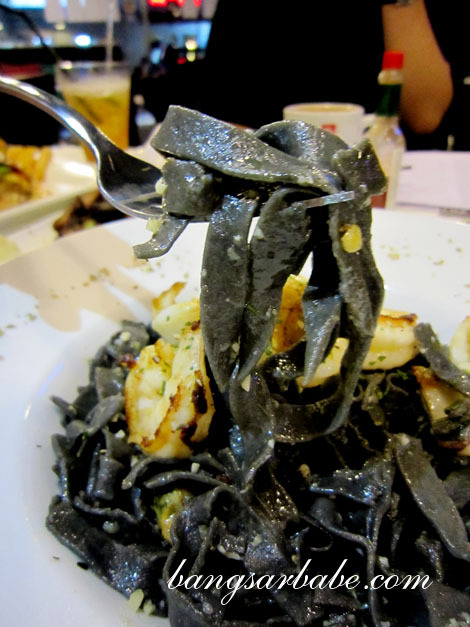 The Grilled Seafood Squid Ink Fettuccine (RM25) was cooked for too long, so the handmade pasta was a tad soft. A pity really, for the seafood was relatively fresh and well accented by the white wine sauce. Verdict: Some fine-tuning still needed, but I’m definitely coming back for the pork burger. They are considering adding an egg inside, based on feedback from customers. You can always ask them to add an egg in, to make it more extreme haha. I normally google for reviews on restaurant before I try the food. Would really appreciate honest reviews that would also help the vendor to improve. I ordered Squid ink fettucine, Black Angus Steak and extreme porky burger and none of them was prepared up to standards. The marinara sauce is plain sugar sweet without any character, The so called black angus is ultra thin with holes all over the steak and was fried some kind of local taste seasoning and the pork burger was just edible. Sorry to hear about your unpleasant experience. I somewhat agree that the food standard isn’t quite there yet. For me, the pork burger was good but the fettuccine was less than satisfactory. I visited them a second time a few weeks back and noticed they were still struggling with their QC. 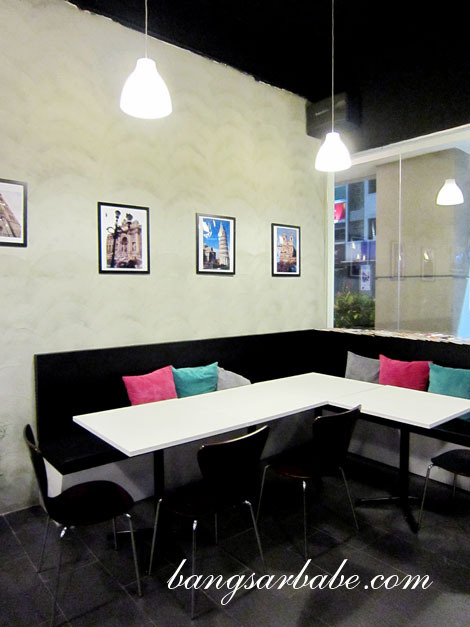 Hopefully, the food quality will improve after hearing comments from the public. We had a great time chatting with you both and we’re looking forward to seeing both of you again soon and we hope that we can score even higher in the future! i wonder what they named the desert? “the bangsar babe”? 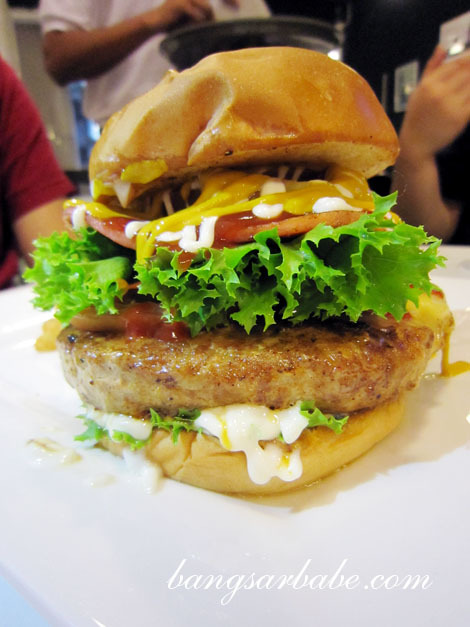 I want to try the stuff squid and also the burger..
Is there any other pork dishes other than the burger? 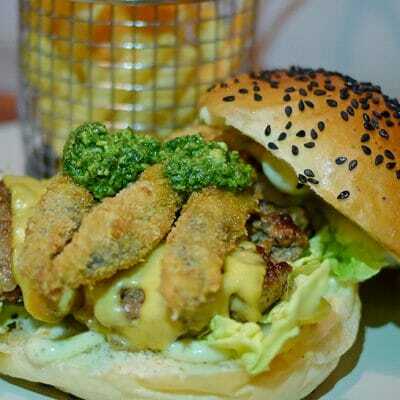 The Extreme Pork Burger looks good and the way you describe things is mouthwatering especially since I haven’t eaten. Heh. 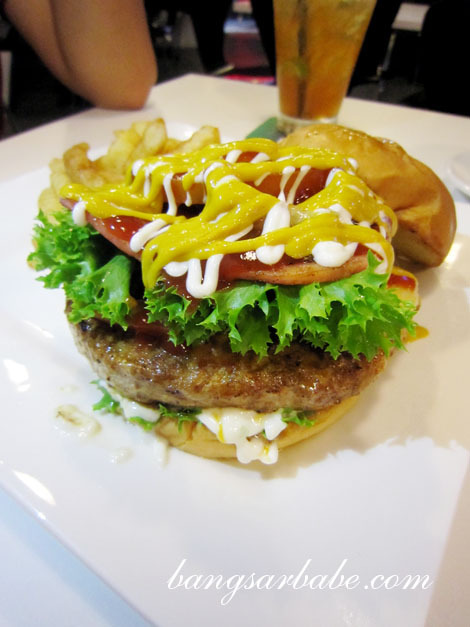 I want to have the extreme pork burger…agreeably a sunny side up with it will be awesome maximus.